I will start out with a request for an automated migration tool so that I don't have to waste hours manually migrating form one version to the next. jcharltoncarp wrote: I will start out with a request for an automated migration tool so that I don't have to waste hours manually migrating form one version to the next. Loading a plugin bundle from a previous SketchUp version with the Sketchucation Plugin store is very fast. You can also export your old shortcuts keys and import into the new version. I was up and running in a matter of minutes. Snap on imported vector PDFs. I could swear this used to exist and was removed some versions ago. External Reference Manager, for Components / DWGs / PDF underlays so they can be easily reloaded / unloaded / replaced. Would be great for large projects and collaboration. I know some of these things exist as plugins or workarounds, but they really should be added by Trimble, not force us to pay 3rd parties. Some of them have been requests for years since the early google era. I would really like the layer drop down in the entity info window to show more than 5 layers. I am organizing my models into 100 plus layers and when I create a component or group, there's a lot of scrolling through the list to find the layer on which I want to place it. bobrsta wrote: I would really like the layer drop down in the entity info window to show more than 5 layers. I am organizing my models into 100 plus layers and when I create a component or group, there's a lot of scrolling through the list to find the layer on which I want to place it. As a work around, bob, have you tried selecting the drop down menu and starting to type the name of the layer? When you highlight the desired layer, hit Enter. I would like the Windows version to have 2 or more files open at once - I gather the Mac version already has this feature. John, you can have 2 or more SketchUp files open at once in Windows. I regularly have 2 or 3 going at the same time. Right now on my PC. John Sayers wrote: I would like the Windows version to have 2 or more files open at once - I gather the Mac version already has this feature. On a MAC you only ever have one instance of SketchUp running - but then that one app can have several models [SKPs] open at the same time. With Windows [PC] you have individual instances of SketchUp running - each is limited to have one model [SKP] loaded at any one time. If you open another model from within an instance of SketchUp, then that instance's current model closes and the chosen model opens. Yes Dave - but you have to open separate sketchup programs - you can't just be on the one open sketchup and load another and have them both in the one open version and switch between the two. What difference does it make? As on the Mac, you can only work one of them at a time. As I don't use a mac I'm just wondering if you have an advantage in that when you go from one model to the other does the current tool stay selected. By that I mean, with windows each instance is a separate workspace, so if you have the move tool active in one it won't necessarily be active in the other and you need to change focus and then change tool. Does it work the other way on mac, that you open two model in one workspace so swapping from one to the other is using the one toolset? Very nice list for us architects though I'd ignore section cut fills. I'd ask for that as a styles option as SectionCutFace manual filling is key to my workflow and detailing. A scene manager to go along your layer manager and ability to customize which scenes show up on scene tab. I'd like to have my materials linked to a texture file instead of always dealing with an embeded texture. They'd show a low res texture but when the file is changed the low res is changed. Renderers would work with the high res though. Layout could be a built in style manager for sketchup that would override all visual aspects of a sketchup viewport. I'd also love that sections could be multiplanar and managed from Layout too. Add a section poly line in a Layout floor plan viewport and that multiplanar section would be created in Sketchup. I'd like to be able to have multiple active sections simultaneously which is slightly different that a multiplanar section. It could be the perfect portal to adding more visual fluff to your models. I still cant get on with those darn trays! Barry, where do you want the utility windows to be displayed? Dave R wrote: Barry, where do you want the utility windows to be displayed? Short answer... anywhere I want, with infinite sizeability and a lot of flexibility. I know you will say all doable with new trays, but they are a pain to organize. I spent 10 years with the old system. Did they ask us if we wanted a new one? Certainly didn't ask me. Barry, I get it although I can't understand wanting the windows scattered all over the drawing space. Would you be constantly moving them out of your way so you can see the model? Ever since the stacking windows were released I've stacked them on the right side out side of the drawing space where they are neat and orderly and never covered any of the model. This is my SU2015. For me, the trays are natural with the added bonus of more real estate for toolbar buttons at the top. I rarely need a window to be wider than the default but it's easy enough to drag the tray to make it wider when I do. Oh well, guess I will have to learn to live with them, thanks Dave. But I would be pleased to give you a serious THUMBS-UP for your beautiful English interpolated from, (I assume), German. I think he means to not have to click continuously to dig into groups/components. If you ever used Fredos Animator you are able to select deep into a component from a dropdown list. I think this is requesting similar behaviour to save the digging to get to the meat. Isn't this a bit like what outliner does? Introduce the option to switch OFF the new inferences, they are a pain and I for one would like them gone. I have seen so much criticism of the tray system, introduced in SU 2015, that I must come to the defense of the trays. If you use two monitors as many of us do it's a great way of organizing windows for quick access. Even with one monitor the trays can be hidden with the auto-hide feature. Also the biggest advantage of SU is it's basic simplicity -no new tools please. That's what plugins are for! And finally please don't change nomenclature - I still call it the VCB whatever SU has changed the name to. 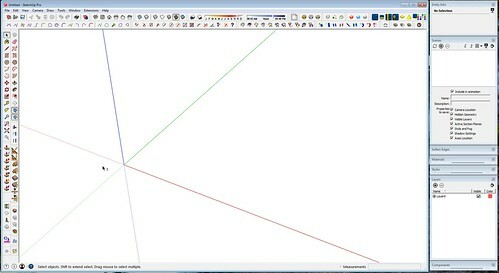 The Layer Manager organizes geometry for user convenience which it does well. However, SU is being used for a variety of different purposes by so many people/disciplines. I feel Layer Manager redesign needs to be a primary target of SU 2018. It could alleviate a lot of frustration for many users and facilitate modeling efficiency. My contention is that it needs to be far more flexible/configurable, with hooks in the API that will allow developers to do their thing. Use the Spreadsheet paradigm. The current fields/columns would would remain the same (and perhaps unconfigurable ?) so that templates and models from previous versions would remain in tact. The UI would be user modifiable. New Columns could be added which could be assigned properties which could be sorted alphabetically, numerically, etc., for instance: a project phase assignment and I suspect many other useful category designations needed for different disciplines. Column order would be changed by merely dragging column headings with the mouse. They could be assigned a background color. Perhaps styles could be assigned to columns which could be toggled on or off for specific layer(s). Layers could have sublayers ( a sublayer "level" would be assigned as a "child" column with the ability to control the indentation of each child column by allowing the user to drag the sublayer column borders sideways). There would be a *SOLO MODE* for layers. When toggled on to Solo Mode, all other layers would be temporarily hidden. This would facilitate editing of complex models and quickly verifying that geometry has been assigned to the proper layer. I guess you could consider this suggestion to be a Data and Geometry Management system with a Layer Manager contained within in it. Last edited by JClements on Fri Mar 10, 2017 8:07 pm, edited 1 time in total. i am voting for the use of dwg's with layout insertion of pdfs into layout and sketchup, also coming from a non developer or programming knowledge why do dimensions not import "if you have turbocad pro you can workaround that dimensions import"